After seven sold-out shows in February, “SPANK! 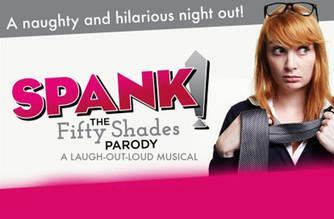 The Fifty Shades Parody” will be performed for eight more shows May 1-5 at The City Theatre in Detroit. play is not affiliated with the E.L. James’ “50 Shades of Grey” novel series it parodies. Those wildly successful erotica books detail the S/M relationship between an innocent, beautiful young woman and a wealthy, enigmatic and controlling international entrepreneur. FYI: Performances of “SPANK!” will be 7:30 p.m. Wednesday, May 1; 7:30 p.m. Thursday, May 2; 6:30 and 9:30 p.m. Friday, May 3; 6 p.m. and 9 p.m. Saturday, May 4; and 2 and 7 p.m. Sunday May 5 at The City Theatre, 2301 Woodward Ave., in Detroit. Tickets are $45.50 and can be purchased at OlympiaEntertainment.com, The Fox Theatre and Joe Louis Arena box offices, Hockeytown Authentics in Troy, Ticketmaster locations and ticketmaster.com. Actress Amanda Barker, a Massachusetts native residing in Toronto, narrates the play as E.B.J., a takeoff on “Fifty Shades of Grey” writer E.L. James. Barker was Major League Baseball’s first and only female mascot for the Toronto Blue Jays. She also does stand-up and writes sketch comedy, in addition to acting in commercials, directing productions and taking roles in television, stage shows and film. Danielle Trzcinski of New York City plays Tasha Woode, the parody of “Grey” heroine Anastasia Steele. Trzcinski was part of FringeNYC’s “Non-Equity the Musical!” which she wrote, and she made the top 25 in NBC’s “Last Comic Standing NY,” in addition to participating in other shows and tours. The satire pokes fun at scenes mostly from the first book, though at times touching on others from the trilogy, Barker says. The jokes rise from the story set-up and suggestions of the novel, as well as audience involvement. While those who know the novels enjoyed the play, Barker said people who haven’t read the books still find it hilarious.